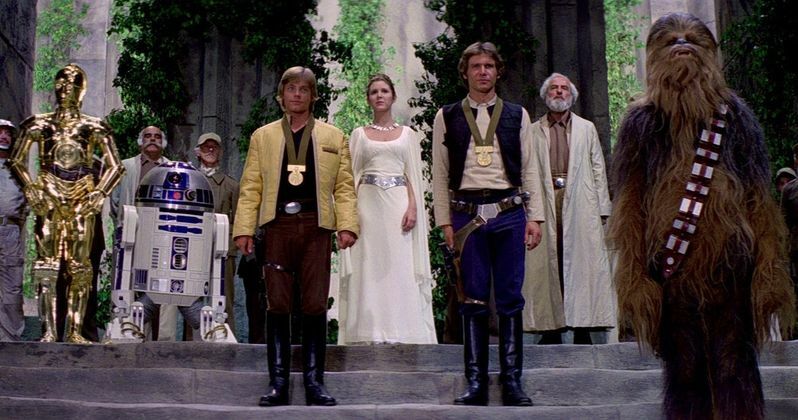 For years, Star Wars fans have wondered about and argued over the fact that Chewbacca isn't awarded a medal at the end of A New Hope. After Disney took control of the franchise, an answer was given in an official comic book. But George Lucas had actually answered this question way back in 1977. It's no longer considered canon, but it does come from the creator of this universe himself. The end of A New Hope, which was released simply as Star Wars back in the summer of 1977, ended with a giant awards ceremony honoring Luke Skywalker and Han Solo, who together blew up the dreaded Death Star. Chewbacca was the co-pilot of the Millennium Falcon, doing just as much as Han to clear a path for Luke in blowing up the giant space station, but he does not get awarded a medal. At the time of release, no one realized that this movie would be the first in an ongoing franchise that is still as strong today as it ever was. The awards ceremony has always been a hot bed of controversy. It implies that the Rebel Alliance only recognizes humans. But it was recently pointed out that George Lucas answered the controversy the year the movie came out. The director had recorded some 'in-character' spots to help flesh out the universe. Though, these spots are definitely not considered canon any more. "Chewbacca wasn't given a medal because medals don't really mean much to Wookiees. They don't really put too much credence in them. They have different kinds of ceremonies. The Wookiee Chewbacca was in fact given a great prize and honor during a ceremony with his own people. The whole contingent from the Rebel Alliance went to Chewbacca's people and participated in a very large celebration. It was an honor for the entire Wookiee race." One of the spots in question also gave Han Solo a backstory that is quite different than what eventually wound up in Solo: A Star Wars Story. In 2015, during the lead up to The Force Awakens under the new Disney banner, Marvel Comics published a new Chewbacca miniseries to get fans hyped for the impending movie. It is set shortly after the events seen in A New Hope. Chewie befriends a young girl named Zarro, who could speak Shyriiwook. Near the end of this tale, Chewbacca gave the girl his Rebel Alliance medal, hinting at the second ceremony in which he was awarded the trophy for help in destroying the Death Star. Zarro turned the gift away, but Chewie insisted that he never wanted it to begin with. In a separate interview published by CinemaBlend, Peter Mayhew had two very practical reasons why Chewbacca wasn't awarded a medal, which all had to do with the actual filming of the movie, claiming that the in-trouble production didn't have enough money to buy a third medal. It was also suggested that Carrie Fisher simply couldn't reach Mayhew's neck, and it was too expensive to build her a step on the finished set. However, for those who really need an answer, it appears that according to the info provided by Screen Rant, George Lucas answered this in the earliest of days for the mega-franchise.